The Shire Horse is a native of England, but the Midland counties of Lincoln, Derby, Cambridge, Norfolk, Nottingham, Leicester and Huntington, collectively known as “The Shires”, were the special homes. History mentions the horse by different names: the Great Horse, the War Horse, the Cart Horse, the Old England Black Horse, the Lincolnshire Giant as well as the Shire. The Shire breed began over 1000 years ago, developing from the horses of Julius Caesar and infusions of the blood of Belgians, Horses of Flanders, and in the 18th century, Friesians. It was also during the 18th century that Shires came into use for drayage, farming, and coach use. The Shire Horse Society of England, the original registry for the Shire, was officially established in 1878 as the English Cart Horse Society, but changed it’s name to Shire Horse Society in 1883, as the term “cart horse” was used then much as “draft horse” is used today. The first Shires were imported to the United States around the middle of the 19th century, and the American Shire Horse Association was established in 1885. The Shire is a good and faithful worker in agriculture and commerce, and has been said to be a synonym for strength, constitution, energy, and endurance. They are docile and kind, but have personality to spare and a strong desire to form a genuine partnership with the people who handle them. They are used for every discipline a horse can be used for, from logging to commercial carriage driving to dressage to trail riding. Living up to his calm and accepting nature, the Shire has shown himself to be a champion in all these areas, from the show ring to the furrow. Shires may be black, brown, bay or gray. Occasionally a sorrel will be seen. They usually have some white facial marking, typically a blaze, and white stockings, often on all 4 legs and reaching up to or over the knees and hocks. The legs will always bear the famous “feather”, long thick hairs springing from the legs below the knees and hocks that will in most cases cover the entire hoof down to the ground. Shires range from 16.2 hands upward, average height being 17.2, but many individuals reaching 18 to 19 hands and taller. Shires can weigh as much as 2800 lbs or more, but weights between 1800 and 2100 lbs are most common. The Percheron horse originated in the province of Le Perche, near Normandy in France. The “true” Percheron horse was developed in the 17th and 18th centuries, but there is evidence that the breed existed during the ice age. In the 19th century, the French government established an official stud at Le Pin for the development of army mounts and for the encouragement of the breeding industry. The Percheron horse of today has a very pleasing disposition. They are proud, alert, intelligent, and a very willing worker. Percherons are usually black or grey, but sorrels, bays and roans do exist. White markings sometimes appear on the head and/or feet, but an excessive amount of white is undesirable. Percherons range in height from 15 to 19 hands high, but the average Percheron stands between 16.2 and 17.3 hands high. Percherons can weigh up to 2,700 pounds or more, but average around 2,000 pounds. The Clydesdale was developed by the farmers in a district in Scotland called Lanarkshire. Although the breed was developed primarily to suit the needs of the Lanarkshire farmers, it also widely used for heavy haulage in the streets of Glasgow. The Clydesdale Association was formed in 1877, and proved to be a major driving source for the breed. Clydesdales are quite active horses. They are gentle for their large size and enjoy interacting with people. They certainly earn their nickname of “The Gentle Giants”. The most common color of Clydesdales is bay. Browns, black, chestnut, and roan also occur in some instances. The preferred markings are four white socks, extending to the knee or hock, along with a well defined blaze on the face. Clydesdales stand between 16.2 hands and 18 hands high, but can be over 19 hands high in some cases. Most Clydesdales range in weight from 1,600 to 1,800 pounds, but some of the mature stallions will weigh up to 2,200 pounds or more. The Suffolk Punch was developed in eastern England, during the medieval times. The homeland of the Suffolk horses was Norfolk and Suffolk counties. With the mechanization, which followed the Second World War, the Suffolk breed took a drastic cut in numbers. Although the 1950’s were tough on the draft horse industry, it rebounded during the 1960’s, and the 1970’s, importations from England were on an upswing. The Suffolk breed of horse has a splendid disposition, and easy temperament. They are a willing worker and have superb endurance. Their color is chestnut, ranging from light golden to dark liver. limited to the face and feet. The average height of a Suffolk horse is 16.1 hands, but many stallions stand 17 hands or more. The 20th century has seen wild swings in the fortunes of the working horse. From its heyday in the first quarter, when it was the engine of industry in a way, which is generally unappreciated, to its decline after the war years, its near disappearance in the 1950s and 1960s, and its revival in the 1970s and 1980s, the future of working horses has been at the impulse of man and his inventions. The 1990's can probably be seen as a period of consolidation of those revival years. Despite recession and the dramatic/effects on agriculture of various public health scares affecting the finances of many heavy horse owners, the numbers and activities of draught horses appear to have been maintained. As at other times during the century, the tenacity of individuals and a few organisations have been responsible for the survival of this draught animal in roles which may appear incongruous in the modern age. As we enter the new century, men who worked daily with horses on farms and fields in towns and cities, in docks and on railways, in factories and yards are passing on - and with them their intimate knowledge of the skills and techniques of horsemanship at its best. Yet they are being replaced, by younger men and woman keen to work with horses whose temperament and usefulness is both endearing and challenging. The most forward thinking of the traditional carters and experienced horsemen are prepared to pass on their knowledge, and there now exists a national training framework through which they can do so. For others, chats over the fence are preferred, and many of today’s younger Horsemen and woman are pleased to acknowledge their older mentors. The breeding of pedigree draught horses remains predominantly in the hands of those who saved them during the 1950s and 1960s and their successors, very often sons and daughters. Yet the traditional ways, which are still important, are giving ground to modern techniques. Greater mobility within the UK means that mare owners are prepared to travel many miles to a suitable, or fashionable, stallion. Stallions once ‘walked’ to mares at local farms, but now they stand at stud either with their owner or with a society, which hires them for a season. Other stallions, not of championship quality but sound in all other aspects, are probably just as good a sire for most mares, and worth some research before they are rejected. Appropriate stallions can best be found through the secretaries of the various breed societies, which receive financial assistance towards breeding programes from the Horserace Betting Levy Board. Exports of pedigree draught horses increased in the 1970s and 1980s. Clydesdale breeders were very successful at selling to Canada, the USA and Australia in particular. Some concern is expressed that many of the best animals go overseas. The Shire found a new market in Europe, Germany, France and the Netherlands especially. In these countries new societies have been established which are affiliated to the mother society in Britain. The USA continues to import Shires including sonic notable champion stallions. The Rare Breeds Survival Trust (RBST) monitors the fortunes of the breeds. The Suffolk is on the priority list in category 1 (critical), and has some 80 breeding females. The Clydesdale is in category 4 (at risk). The Shire remains the most numerous of the heavy breeds, staying off the priority list, but included among minority breeds, being constantly monitored. Economic factors could easily shift it into the priority category however, and some, especially its American supporters, believe that its numbers are sufficiently low to cause concern. Other horses and ponies on the RBST priority or minority lists are the Cleveland Bay, Eriskay, Exmoor, Dales, Irish Draught and Fell, all of which were traditionally used for draught work in their native regions. 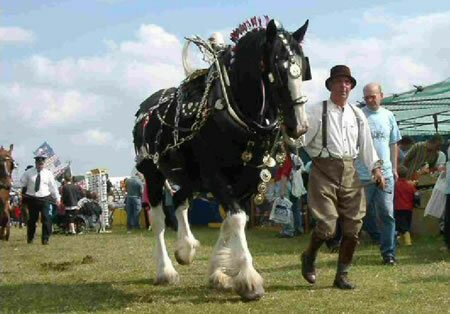 The British Percheron, while not a native breed, is given financial help towards breeding programes by the Horserace Betting Levy Board, on the basis that its breeding statistics are comparable to those on the RBST list. Fortunately its relationship with its relatively numerous French cousins gives it stability. Timber extraction by horse has been the surprising growth area in the use of working horses in the UK over the last 20 years. From a handful of people in the early 1970s, this activity has grown until the new British Horse Loggers Association was subsumed into the larger, professional Forestry Contractors Association in the mid 1990s — the clearest indication that horses were accepted by the Forestry Industry. Prior to that, the forestry authority had carried out technical research surveys into the production levels of horse-drawn extraction operations and found in their favour. Where environmentally sensitive ground, conservation areas or steep slopes were involved, horses were economically sound. Their production levels were less than those of modern machines, but not drastically so. While machinery could still do the job, the damage to the forest floor was unacceptable the imprint of hooves and dragged timber was negligible in comparison. A number of horsemen used to agricultural work began extracting timber as part of their living, a few eventually turning to work full-time. Some foresters were prepared to turn away from machines to horses — an important factor, since a knowledge of forestry is vital to horse operations in woodland. Courses encouraged the safe efficient practice of horse extraction using horses. There are now some 70 professional or part-professional horse loggers working throughout Britain. Much of the romance of the steam fire engine can be attributed to the horses that pull them. Most breeds of draft horses today are much larger than they were one hundred years ago. Large cities often had beautiful matched teams of recognized breeds, but in smaller communities many of the horses used to pull the steam fire engines were mixed breeds, whatever type of carriage horses that were available. Horses with obvious Morgan bloodlines were often seen. Just as the firemen who ran them, the horses that pulled them were frequently volunteers who had other jobs to do when there were no fires. The teams that pulled our engine over the years belonged to a local livery and pulled an ice wagon. The town had a loud alarm to signal a fire, and the horses so loved their volunteer duty, that if the ice wagon driver was not on his wagon when the alarm sounded, he would find his wagon at the fire station with the horses ready to pull the engine. When the steamer was no longer used and the last team was put out to pasture to relax for the rest of their days a few miles from town. One day the prevailing wind carried the sound of the alarm to the old fire horses. They promptly went over or through the fences that held them and down the highway to the fire station where they were found waiting to be hitched to the old steamer gathering dust in the corner. Go to the Gallery in the "About Us" tab to see more photos of horses at Hollowell.